Do you ever wish Mario and Sonic could appear in an action game together? Like say, a 2D or 3D platformer? Something more than an Olympics tie in game? Naka: “Actually, I wanted Mario [and Sonic] to appear together, so one time I went to give Miyamoto-san a presentation on how I want to create an action game which is co-starred by Mario and Sonic. It was in the GameCube days, and I took around four planners with me. 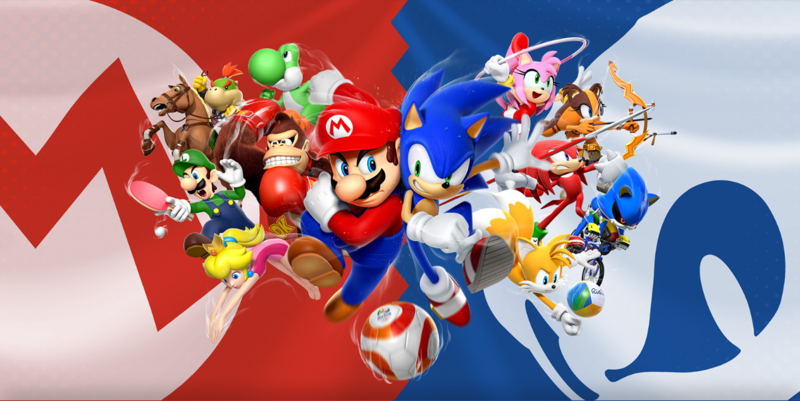 It is a pity that the discussion was ‘clearly it isn’t necessary for Mario and Sonic to co-star in an action [game]’ and it didn’t become a reality, but SEGA was able to get the license for the Olympics just at that time, so in order to make the best use of the license, companion characters appeared together. A little later Sonic appeared in Super Smash Bros. Brawl. However, this too came into reality because I requested from Sakurai-san, ‘I want Sonic to appear [in Smash Bros.]’. The Olympics is a bit different from my wish, but I think it’s a good thing that children around the world are happy about them co-starring. But someday I want to realize an action [game] together with Mario. I think I’m going to give another presentation so that Takashi [Iizuka] finds the necessity [of a Mario & Sonic action game] (laughs). Unfortunately, the discussion didn’t quite work out that way. Eventually, the discussion had someone say ‘clearly it isn’t necessary for Mario and Sonic to co-star in an action game’, and the idea was dropped. In it’s place? The ‘good’ old Mario & Sonic titles where they take part in the Olympic Games. Not terrible, but disappointing regardless. But it’s not happening now. Instead, only the Subspace Emissary and fan projects (like Mushroom Kingdom Fusion) can offer a taste of this dream title. Still, what do you think? Would you want Mario and Sonic to star in an action game together? And what would it ideally be like? For some reason, whenever a Nintendo property crosses over with something else it's always something weird like sports or board games or idols.